One of the things that really strikes me in the current dialogue about the shifting interest towards ethically sourced jewellery is the largely singular focus on diamonds. I’m sure this won’t come as a surprise to many people, but more than just diamonds go into making jewellery! Right now we’re seeing big industry players like Tiffanys, Diamond Foundry and Goldsmiths talking up their various diamond credentials. But what about the precious metals? And what about non-diamond gemstones? What’s really important to note, from an environmental viewpoint at least, is that mined diamonds aren’t the worst offenders. No question things are improving in the diamond sector. Though the tens of millions of people directly and indirectly involved in Artisanal Small Mining (ASM) in developing nations still have it pretty bad. ASMs produce a relatively small percentage of the world’s jewellery grade diamonds yet support a disproportionately large number of people with few alternative sources of income. That means, as an industry, we should be encouraging positive development of the sector. Don’t get me wrong, diamond mining isn’t good for the planet. But let’s put it in perspective. According to a report produced by Frost & Sullivan last year (Environmental Impact Analysis: Production of Rough Diamonds), harmful carbon emissions produced by mined diamonds are in the order of 57kgs per carat. That’s less than a high-spec mobile phone (which sits at about 80kgs). And when you consider the relative lifetime cost – a couple of years from a mobile phone versus an essentially infinite lifetime for a diamond – the lifetime carbon cost of a mined diamond is very low. But, of course, jewellery doesn’t consist only of diamonds. Basically the same social issues exist in the precious metal mining industries as do in the diamond sector. There are ASMs (though only producing gold and silver, not platinum) that suffer in largely the same ways as diamond miners. Plus, the precious metals mining industry generates disturbingly high levels of greenhouse gas (GHG) emissions. What’s the carbon cost of a diamond ring? Transparency, traceability and all those things are important when it comes to diamonds, but they’re not the whole story. Consider a one carat, solitaire diamond ring in 18 carat gold (as an example). 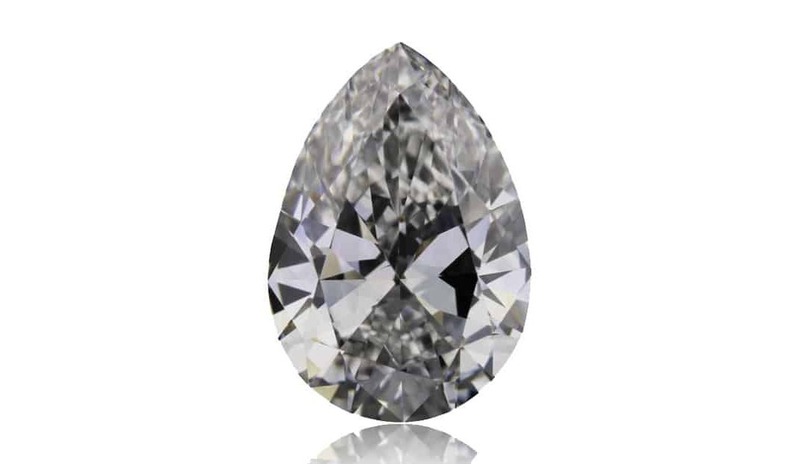 As already mentioned, the diamond will carry a carbon cost of about 57kgs. But what about the gold? Mined gold (from whatever source) has a carbon cost of approximately 38,100:1 (World Gold Council, 2017). In other words, for every gram of gold produced, you’re looking at about 38kgs of CO2 equivalents being released into the atmosphere. 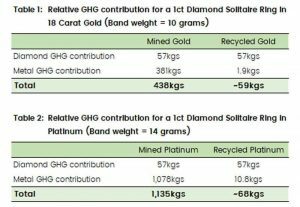 When applying these numbers to our one carat diamond ring (with, say, 10 grams of gold in the band), the diamond is responsible for releasing 57kgs of GHGs. However, the band contributes almost seven times as much – 380kgs of GHGs (not including manufacturing). That is, the total carbon cost of a one carat diamond ring made with mined gold and a mined diamond is upwards of 450kgs – plus manufacturing, transport, packaging and so on. Off-setting the carbon footprint of a ring set like this made with a mined diamond and mined platinum would require planting at least several hundreds trees. But because the set is made with a post-consumer diamond and recycled platinum, its carbon footprint can be offset by planting just four or five trees. ASM is not a thing when it comes to the platinum group metals (PGMs), but there are still social problems associated with large scale mining in developing countries. That said, there are fewer issues with the PGM supply chain when compared with the gold supply chain. However, PGM production is far from planet-friendly. Their production generates almost twice as many GHG emissions by weight as does gold (77,000:1). Well, on the social responsibility side, fair-mined gold is a very good alternative. But it doesn’t address the greenhouse gas issue. As for PGMs, they’re only produced on a large scale, so finding an alternative to mining doesn’t disadvantage ASM communities. Efficient, regulated, large scale recycling infrastructures are already in place for precious metals like gold, platinum, palladium and rhodium. Recycled precious metals are readily available and are essentially identical to their mined counterparts. They also trade at the same price as mined precious metals, so there’s no financial disincentive to use them. Importantly, recycling produces only a fraction of the greenhouse gases that mining does. As you can plainly see, using recycled precious metals is much better for the planet! Where do Lab-grown Diamonds fit in? If GHG emissions are your primary concern, then ethically-sourced lab-grown diamonds are pretty much unbeatable. 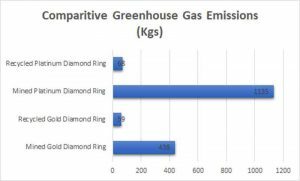 In the examples above, the GHG emission contribution from the diamond would approach zero if it were lab-grown. That means, when in combination with recycled metals, you’re looking at a very environmentally friendly product (relatively speaking). Environmental data relating to the coloured gemstone sector (mined and lab-grown) is scarce. Socially there’s more to tell. Coloured gemstones are produced in 46 countries around the world. Many of them developing nations. And around 75-80% of jewellery grade gemstones are retrieved by artisanal small scale mining operations. (UNICRI, 2013). Basically the same environmental and social issues exist for ASMs produced gemstones as those that exist for ASM diamond and gold producers. Exploitation, corruption, child labour, habitat destruction and workplace safety issues are all major concerns. Hence, transparency and traceability when it comes to coloured gemstones is every bit as important. Yet it gets little attention. In fact, I’d go so far as to say it’s a subject that’s actively avoided in some circles because, unfortunately, some of the world’s most beautiful and valuable gemstones come from some of the most dangerous places on Earth. Were you to examine the human cost of their production you probably wouldn’t touch some of them with a barge pole. That’s why we will only use only recycled and Fair Trade coloured gemstones or carefully sourced lab-grown gemstones in our jewellery. My point is, if you want to be an ethical consumer of jewellery, or you want to hold yourself up as an ethical producer, then getting the diamond bit right is, on its own, nowhere near enough. To be credible, the industry must hold itself to much higher standards. It must enlighten consumers to the whole story, and it must do a lot more than just offer diamonds as the proverbial sacrificial lamb.